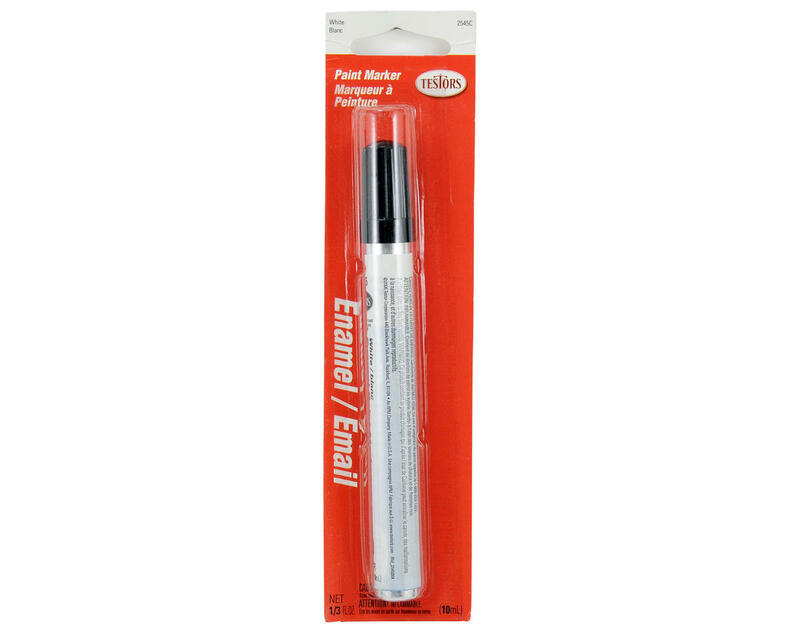 This is a 10ml Testors White Gloss Enamel Paint Marker. Quickly and easily add cool, bright colored details to almost any surface with these paint markers from Testors. Testors paint markers are an ideal tool used for fine detail work on plastic models and pinewood derby cars, but works equally as well on ceramic, leather, stone, metal, styrofoam, glass, paper, fabric and wood surfaces. These are great to use to on your project to give it that personalized custom touch. These all-purpose markers contain no lead and have tips designed for fine-line painting as well as painting on larger areas. NOTE: Cap removes by twisting; shake marker for 30 seconds before using and depress tip to get steady, activated flow. Depress tip occasionally to maintain paint flow, and recap and shake periodically for better flow. Replace cap tightly when marker is not in use. If tip dries out, soak overnight in Thinner. Not recommended for vinyl, polyethylene, polypropylene plastics, or lexan.